Half Eternity Rings are seen as an alternative to Full Eternity Rings. Half Eternity Rings are set with gemstones only partially along the band. 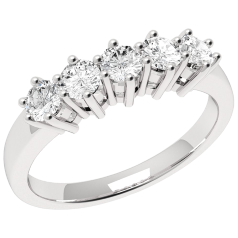 Their beauty and strength make diamonds a popular choice for half Eternity Rings. 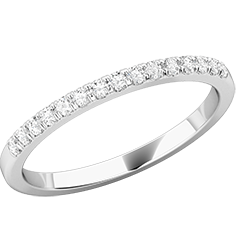 Because the diamonds do not go all the way around the ring, Half Eternity Rings can be more comfortable than full Eternity Rings, which need to be thicker. Because the stones are set only on the visible side of the ring, Half Eternity Rings can be resized when needed. Since the stones go only half way around the ring, half Eternity Rings are also a more economical option. Half Eternity Rings are also a good choice when you like a look similar to that of a Full Eternity Ring, but would want your ring to be personalized with an engraving. 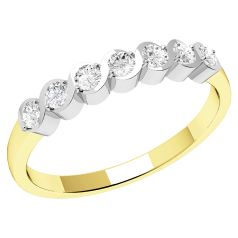 We offer our Half Eternity Rings in a selection of precious metals, like white gold, yellow gold, platinum, and palladium. On our website you can choose from Half Eternity Rings with different shapes of diamonds, like round Brilliant, Princess, Baguette, or Emerald, held in place by different styles of settings, e.g. Channel, Bar, Claw, and Rub-Over setting.